Brown Rice is a 100% whole grain food preferred by health conscious consumers. Each half-cup serving of cooked brown rice equals one whole grain serving. This healthy grain contains the nutrient-dense bran and inner germ layer where the majority of the bioactive compounds are found as well as the starchy endosperm. 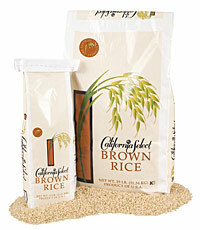 It’s the fiberful bran coating that gives brown rice its light tan color, nutlike flavor, and chewy texture. Whole grains help reduce heart disease and may reduce the risk of certain cancers, and may aid in weight maintenance. In addition to the fiber, whole grains like brown rice are good sources of many vitamins and minerals as well as fermentable carbohydrates, lignans, phytoestrogens and phenolic compounds. All of ACC’s rice varieties are offered in brown rice form.